I passed by that street a few times last week, it really looks like a ghost town. The two bros pizza was the only place that had any activity. I lived in the East Village/Alphabet City from 1980 to 1992; I have friends who grew up there in the 50s and 60s who report that they saw it shift from a lower-middle class Polish/Ukrainian enclave to a bohemian center of NYC, then to a suburban/upper-class faux-bohemian neighborhood. Even when I moved in, the true bohemian era was drawing to a close, with rich NYU kids, models, and wanna-be's taking over; by 1990, there was no real counter-culture there anymore, only imitations. The true Bohemia of the East Village was a short-lived thing, lasting maybe 25 years at the most, in a volatile, ever-changing 184 year history. Thankfully the other boroughs have avoided the faster-growing cancer, so far. They had a branch on Montague Street in Brooklyn Heights, which closed several years ago. 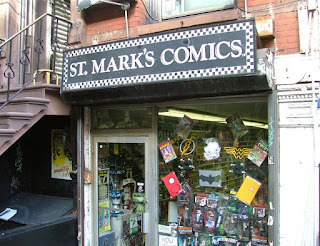 St. Marks was always a 'have to stop at' place. Best comic shop? Not by a long shot but a piece of history that this Long Island boy grew up going to during many NYC visits. I always remember watching my step on one spot the wooden floor where it was a bit...bouncy. I came of age as adolescent skateboarding up and down this street endlessly. I grew up on the LES, my mom took me to East Village Books, Dojo and The St Marks theatre as a kid. 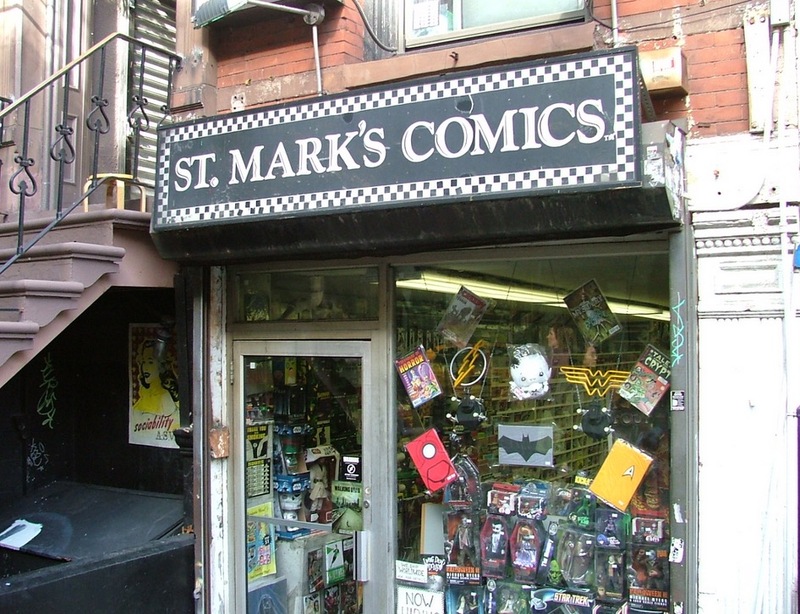 I spent countless hours in St Marks Comics. God I miss the old St Marks from Free Being records to Andy's Cheapies to T n V. No wonder I moved to LA.